SpaceX's Dragon capsule was released from the International Space Station's robotic arm at 9:26 a.m. EDT (1326 GMT) on May 18, 2014. SpaceX's unmanned Dragon capsule departed the International Space Station today, putting it on a path back to Earth after about one month attached to the orbiting outpost. The robotic spacecraft is loaded down with more than 3,500 lbs. (1,587 kg) worth of science samples and supplies which should be safely delivered to Earth once the SpaceX capsule splashes down in the Pacific Ocean later today (May 18). Splashdown is expected to occur at about 3:02 p.m. EDT (1902 GMT) off the coast of Baja California where officials can recover the supply craft. 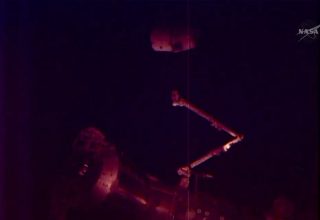 The Dragon capsule orbits with the International Space Station before its release on May 18, 2014. SpaceX's Dragon also performed a series of thruster burns to move a safe distance from the station before it is expected to execute its deorbit burn at about 2:12 p.m. EDT (1812 GMT). Dragon has been attached to the space station since April 20, after its launch atop the private spaceflight company's Falcon 9 rocket on April 18 from Florida. SpaceX successfully performed a daring reusable rocket test during the April 18 launch. The spaceflight company brought the boost stage of the Falcon 9 rocket back to Earth, landing it upright in the ocean, after delivering Dragon to the proper orbit. SpaceX's Dragon capsule flies above Angola while attached to the International Space Station just before its release on May 18, 2014. This mission marks the third official Dragon resupply mission to the International Space Station. When it docked to the station, the spacecraft successfully delivered about 5,000 lbs. (2,268 kilograms) to the crewmembers living and working aboard the space laboratory. At the moment, Dragon is the only cargo ship that can bring supplies back to Earth from the International Space Station. While other spacecraft like Russia's Progress, Europe's ATV and Japan's HTV can deliver cargo to the orbiting outpost, they are destroyed in Earth's atmosphere during re-entry. "It's also very nice to have a vehicle that can take your science equipment and maybe even humans someday back to Earth," space station resident and NASA astronaut Steve Swanson said after Dragon's release. SpaceX is currently developing a manned version of the Dragon that could potentially bring humans to and from the orbiting outpost in the future. SpaceX currently holds a $1.6 billion contract with NASA to fly 12 resupply missions to the station using the unmanned Dragon capsule and Falcon 9 rocket. But the California-based company isn't the only organization that holds a resupply contract with NASA. The space agency also has a $1.9 billion deal with Orbital Sciences Corp. to fly eight missions to the orbiting outpost using the Cygnus spacecraft and its Antares rocket. Orbital Sciences is scheduled to launch its second cargo run to the station at the beginning of June. At the moment, the space station plays host to an international trio of spaceflyers. NASA's Swanson is joined by Russian cosmonauts Alexander Skvortsov and Oleg Artemyev. They will man the orbiting outpost until a new crew of three launches to space on May 28.